Sometimes when the weather is cold or the kids are feeling a bit sick, I pull out simple random goodies from around the house for a quick boredom buster activity. On this particular day, six year old J was at school and K was constantly pulling at my scarf (I like to wear scarves most days...it makes me feel all fancy). So I took it off and let him play with it. He was having such a blast with the one scarf that I decided to bring down my entire collection for him to play with, which lead to this simple scarf weaving fine motor activity. A variety of scarves - play silks, stretchy or woven wraps (if you have those kicking around) would work well too! 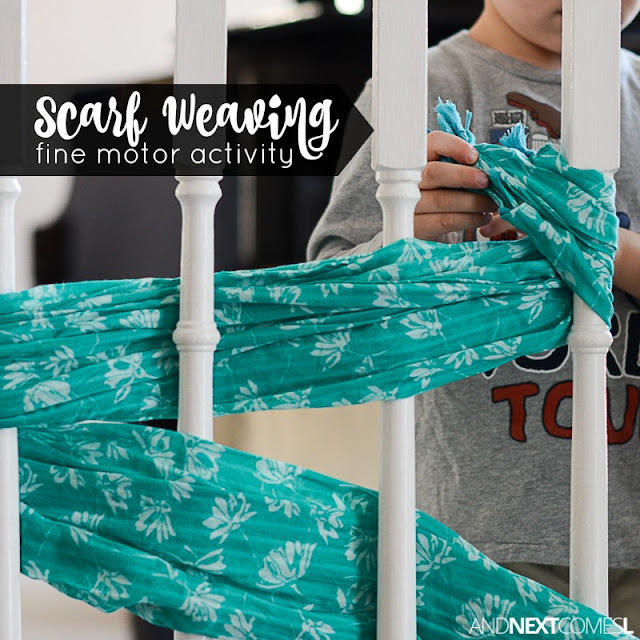 Grab a variety of scarves from around the house and try to use a variety of textures for a nice added tactile sensory component. 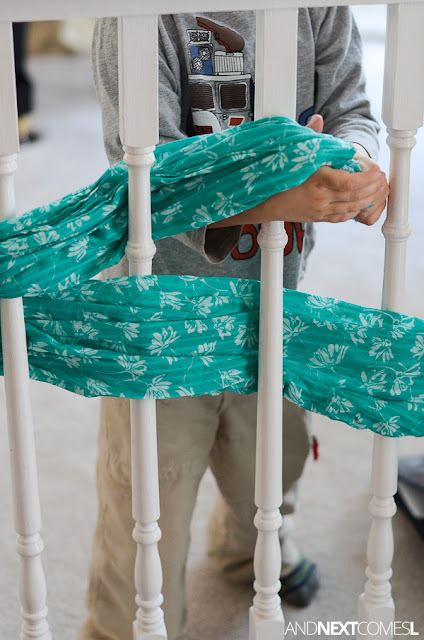 You could use winter scarves, everyday casual scarves, or even play silks or baby wraps, in a pinch. We elected for my everyday casual scarf collection because...well...I have a lot! There's a variety of textures, colors, and prints to explore too so that's why we went with those scarves. 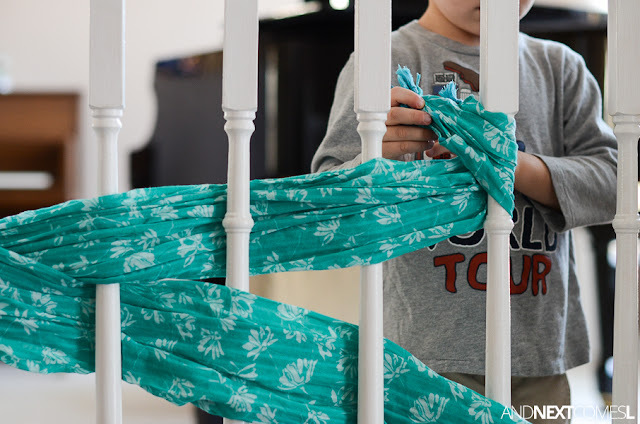 Simply weave the scarves in and out of the banister poles, like below. Then loop back and forth until you run out of scarf. 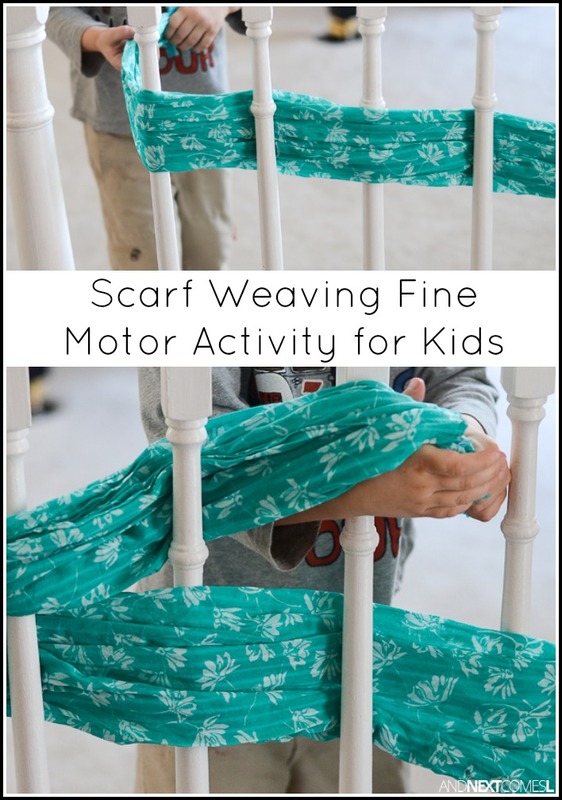 Then repeat with additional scarves. I think a stretchy or woven baby wrap would be ideal for this because of the sheer length of fabric used to make one of those wraps. 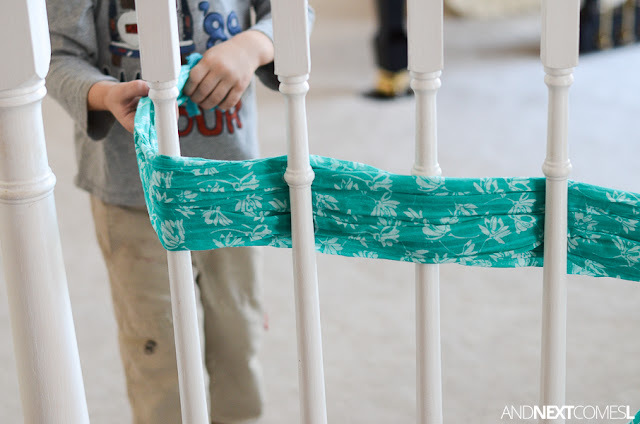 Of course, I thought of that idea after we did this and K no longer wanted to decorate my railings. Regardless, my railings have never looked so beautiful and colorful.